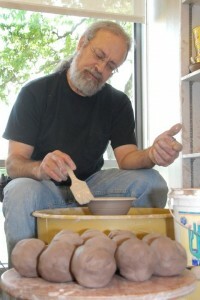 Ceramics instructor, Studio Supervisor, Flint Institute of Art, 2004-present. Artist in Residence for Mayville Community Schools, Oct. 1997-Jan 1998, Instruction, Gas kiln design and construction, Funded by the Saginaw Community Foundation. Ceramics instructor, Mott Community College, Flint, Michigan, winter semester, 1995. Art Instructor, Mott Adult High School. GED Program, Genesee County Jail, Flint, Michigan, 1977-1981. Firemaster, Flint Institute of Art, August, 2002–present; including all gas firing, kiln maintenance, and inventory. Flint Water Crisis Show, Buckham Gallery, 2016. Humanities Art Center, Kettering University, Flint Michigan, February 2015. Three Person Show, Buckham Gallery, Flint Michigan, April 2006. Clay Works! Blue Heron Gallery, Elk Rapids, Michigan, August 2004. “In Their Own Way”, Buckham Gallery, Flint Michigan, December 2003. Program, Kettering University, Flint, Michigan, February 1998. Two person Show, Left Bank Gallery, Flint, Michigan, May 1997. One Man Show, Greater Flint Arts Council, Flint, Michigan, November 1996. Ten Michigan Potters, Buckham Gallery, Flint Michigan, April 1996. Three person show, Buckham Gallery, Flint Michigan, March,1995. Institute of Art, Flint Michigan November 1994-January1995. Three person show, Buckham Gallery, Flint Michigan, February, 1993. Ceramics Invitational, Buckham Gallery, Flint Michigan, March, 1992. One Man Show, Yaw Gallery, Birmingham Michigan, November, 1975, 1977. Michigan Crafts Exhibition 1976, Detroit Institute of Art, January 1976, Peter Voulkos juror, First Place Award. “Source Detroit” Invitational Exhibition, Cranbrook Museum February 1976. Cranbrook Alumni Clay Exhibition, Cranbrook Museum, March 1976. Michigan, Gerhardt Knodel juror, First Place Award. First Flint Invitational, Flint Institute of Art, Flint Michigan, January 1977. One Man Show, Kingswood Lower Gallery, Cranbrook Schools, April 1977. Exhibit “A” Gallery, Chicago Illinois, October 1977.